Today, when you order "Comedy Mini Wallet", you'll instantly be emailed a Penguin Magic gift certificate. You can spend it on anything you like at Penguin, just like cash. Just complete your order as normal, and within seconds you'll get an email with your gift certificate. This is not a magic trick as such but it is a wonderful gag and gets terrific reactions. I have mini driver's licence, credit cards and cash in it and tell people that I accidentally left my wallet in my jeans in the wash. I show them the wallet and it always gets a laugh and questions as to where I got the wallet from. I also make comments about only being able to purchase small sizes at Costco, small coffees at Starbucks, etc. The kicker is when I tell them that fortunately one thing didn't shrink and I pull out the rubber finger cot. Many people laugh so hard - it's great. I have to admit this wallet is better quality than I expected. Sits in the opposite pocket of my regular wallet, and gets some good laughs and fun times. It's also good to keep a mini card in there, and Paul Harris's Improv Nightshades gimmick in. I purchased a few of these for, not only myself, but my children as well who love them. 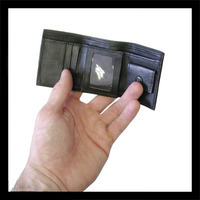 The wallet is an exact replica of a man's leather wallet probably not much different from the one you are carrying right now. More importantly, it comes with instructions including the exact percentages to shrink your own personal driver's license, credit cards, library cards, checks, money, etc. to make it appear more authentic. This lends itself to some very funny comedy routines and lines. A good opener might be somethng like "I left my wallet in my pants pocket when my wife had my suit dry cleaned and look what happened!" or perhaps "My credit limit was reduced to $100!" or "This driver's license is now only good for compact cars and mini vans!" You are truly only limited by your imagination. Personally, I found it very practical as a lead or introduction to my borrowed bill to mismade or whatever else fits the theme. A real pleasure to own and perform with and comes highly recommended.